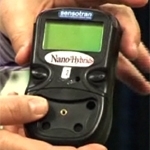 This film gives a short introduction to an EU funded research project called Nano2hybrids. The project involves 8 partners looking for new ways to use nanotechnology to detect gases. Further information on this project can be found under our research section or via the links to the project`s own website where the scientists themselves post their own video diaries.